FB's parents knew that we didn't have rings for our wedding ceremony so they kindly offered if we would like to wear FB's great grandparents' gold rings (still engraved with "12/24/1889" as the date they got married). We tried them on and they were quite big and it was a week before our wedding... so we asked if we could hold onto these rings and perhaps someday find a way to fit them on us. During our ceremony, we tied red strings to each other's ring fingers instead of exchanging rings. The original gold rings from FB's great grandparents have been melted and has become the inner circle with "always+forever" engravings and the outer layer with the new white gold was designed with a crisp sharp profile. To us... it's the perfect marriage of the old and new... the old roots and new generation we will be nurturing. It took us this long because we wanted to work with someone whom we could trust. Thank you Annika, our fabulous jewelry designer in Hamburg, Germany... you're the best... and much much thank you to Heide & Michael for offering the very special rings to us and coordinating and shipping the new rings all the way from Germany to our home in Los Angeles! 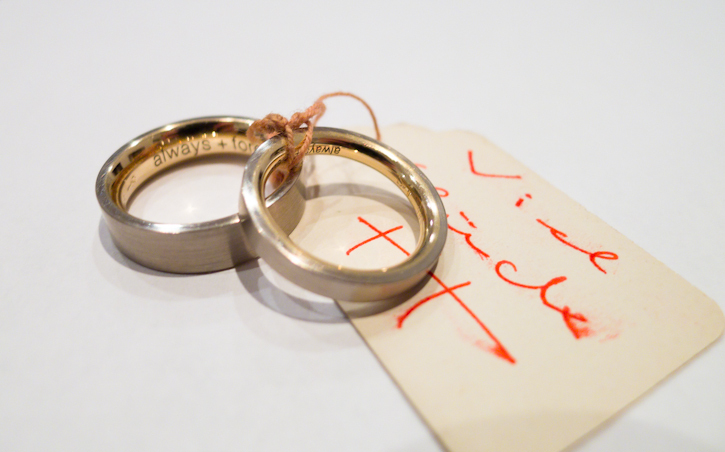 We intend to wear them for a very long time and can't get over how happy we are to have finally meet our own rings. Sometimes good things take time.